Great heroes aren't born... they are forged. For centuries, Acheron has guarded the secrets of his birth that could destroy the world. Now a human woman threatens to expose him and will stop at nothing to do so. The deadliest Daimon, Stryker, has finally met his match. Only this isn't a Dark-Hunter who stands in his way. It's a woman so evil, she makes Stryker look nice. Track It. This book has been $16.57 within the past year. Log In to track Sherrilyn Kenyon on eReaderIQ. 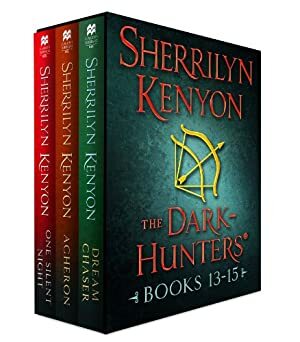 to be notified each time the price drops on any book by Sherrilyn Kenyon. to stop tracking Sherrilyn Kenyon. We started tracking this book on September 4, 2013. This book was $23.97 when we started tracking it. The price of this book has changed 24 times in the past 2,056 days. The current price of this book is $20.78 last checked one day ago. This lowest price this book has been offered at in the past year is $16.57. The lowest price to date was $13.43 last reached on December 2, 2013. This book has been $13.43 one time since we started tracking it. The highest price to date was $23.97 last reached on September 4, 2013. This book has been $23.97 one time since we started tracking it. We last verified the price of this book about one day ago. At that time, the price was $20.78. This price is subject to change. The price displayed on the Amazon.com website at the time of purchase is the price you will pay for this book. Please confirm the price before making any purchases.